A secure, controlled collaboration platform enabling business leaders to swiftly respond to security incidents and manage critical workflows. Conuity Incident Response is a workflow-centric human orchestration platform for senior leadership and cross-functional teams. Conuity's secure virtual collaboration environment enables leadership to mobilize and respond rapidly to cyber and other highly-sensitive incidents. Executives can share information, manage critical workflows, and respond as one within a protected collaboration environment. Not all security incidents are created equal. Some require more secure and timely responses than others. Unfortunately, for events that require extended team collaboration beyond the security group, conventional methods of communicating – emails, voicemails, text messages, and other unsecure tools – could leave your information exposed and vulnerable. Creates and monitors secure, controlled “virtual collaboration rooms” so authorized executives can orchestrate a coordinated response to security events and/or manage protected workflows. Assists in pre-event planning, triage, and post-event review. Ensures the response is secure, controlled, auditable, and compliant to meet changing industry and regulatory mandates, with assurance of non-repudiation of evidence data. Supports pre-configured integrations with industry-leading next-gen SOC / SOAR software platforms. Allows real-time collection from any internal or external data sources – including logs, reports, files, news feeds, social media – to provide a more complete picture of the event as it unfolds. The impact of modern cyber incidents requires a very different, coordinated response than in the past. Organizations need to rethink how information is gathered, analyzed, and shared, and there must be a solid plan in place to adhere to new compliance mandates regarding third-party notifications. 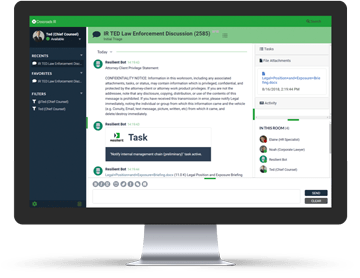 Conuity Incident Response enables the business to coordinate a time-critical, template- and workflow-driven response to internal and external stakeholders, partners, customers, law enforcement, and regulatory bodies. Our friendly interface – featuring industry-specific templates with tight integration to SOAR (Security Orchestration, Automation, and Response) tools – controls access to information based on need-to-know while providing an auditable record of all activities to satisfy legal and regulatory demands.